My First Jury with my Quilling and I was Rejected. So along comes 1987, after doing eight to ten shows a year, and as many as eighteen one year, and I get talked into going to the League of New Hampshire Craftsmen to get juried so I can do their annual 9 day show at Mount Sunapee State Park. The first trip down to Concord to be juried was quite nerve wracking. I show up with a 'body of work' that represents my 'full line of work and my quality'. I spent what seemed like weeks preparing the pieces, being careful to bring only the best work. So I bring a painted wood plaque with nicely quilled flowers, a loon with my original technique of cut out over the quilling, some notecards, and a framed wedding invitation. I set up my work on a table and then was asked to leave while they examined it and discussed the quality and design of my work. The work that I had worked so hard on, the work that I had put my whole heart in. I waited a few minutes. It seemed like an eternity, waiting for a decision that might actually affect my whole life...or so it seemed at the time! The results were devastating to me. I had worked my heart out and failed. The plaque shouldn't be painted, the notecards shouldn't have words on them (they are too specific, like happy birthday), the floral had the wrong color flowers (?! ), and the loon should not be made out of circles, they should look like feathers. When I asked questions, they told me my work was too decorative, they wanted functional. And the color of my quilling paper was wrong, I should dye my own paper and cut it into strips. Okay...understanding that they had never seen quilling before so the jury was essentially jurying something they knew nothing about at the time. So I went home with my quilling under my arm and swore I would never go back. The friend who insisted that I be juried in the first place said you need to go back. Do things like they want and go back. After some pushing and pulling between her and I, I made a loon with feather shaped quilling and a couple of notecards without sayings, and a few other pieces that I can't recall completely right now. I again set my work up on the table and was instructed to leave the room. While they debated. And picked it all over again. More time...more thoughts running wild. This time I received conditional approval! 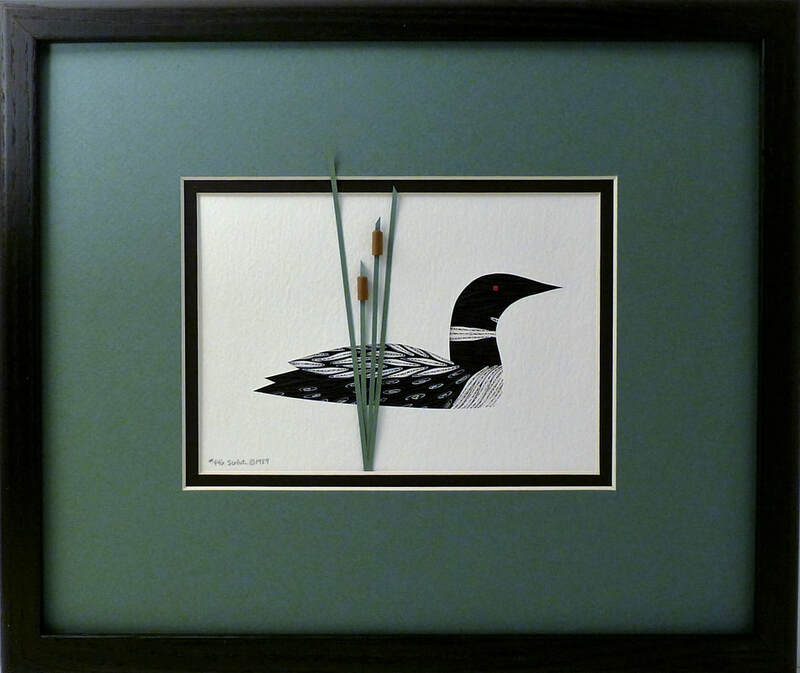 That meant that as long as my work was the same quality and the same technique, I was in...and they were pleased to see that the loon now had feathers. I have to admit that it did look better with feathers than with circles on its back! They liked my technique and my execution after all. Phew! And that, my friends, is my jury story. ​Don't get me wrong, I love being a part of the League of New Hampshire Craftsman, and I am very glad to be participating in my 34th year this summer. I can't wait. to see all my Loons. ​I would love it if you would share my blog with three friends. The story starts in 1973. ​My husband Don and I got married in June and moved to a small town in New Hampshire. 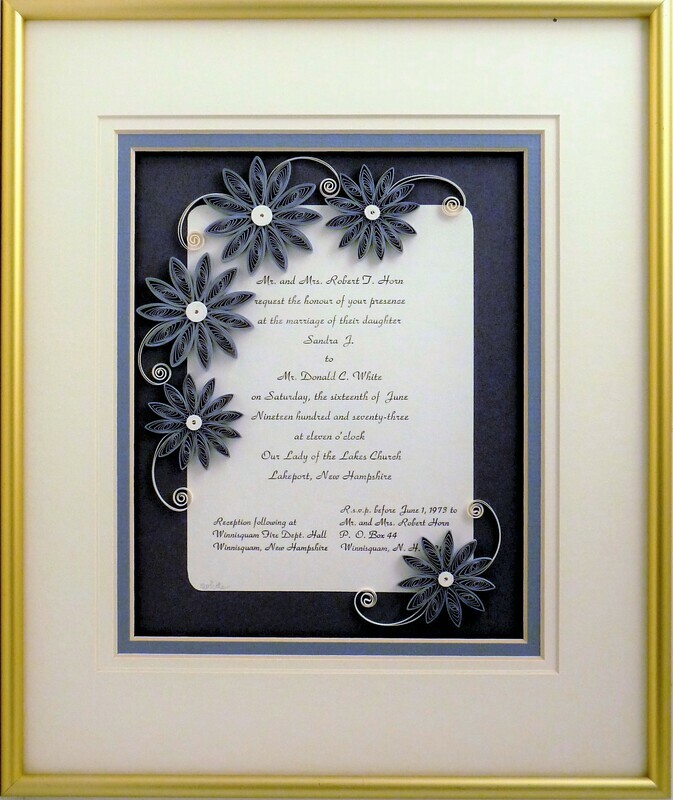 I received a wedding invitation from a college friend and decided I wanted to frame it and embellish it with quilled flowers. I went to the local craft shop and picked up the quilling paper and glue and off I went home. I spent many days wrapping narrow strips of paper around and pin and making flowers and gluing them to the velvet to which I had attached the invitation. I then finished is off with a deep frame and glass. The lady at the craft shop was so helpful that I went back and showed her my work. She looked closely at the quilling and said "there is a quilling tool for that". I immediately gave her my 99 cents and went home. The quilling was so easy with the slotted tool, as the slot holds the end of the paper so you can roll the tool and quickly wrap the paper. Quickly compared to rolling around a pin, that is. Well, I was in love with quilling. Within the year I was rolling up a storm and off to do my first craft fair, where my biggest seller was a little soldier ornament which I sold for $1.00. I also had slices of oak trees that my husband had cut for me, I had sanded and finished with poly. They made great backgrounds for cute little bees and floral arrangements. My beginnings in quilling long ago...and I am still in love with the process. Maybe I'm just in love with paper and all its glory. And I am still in love with the quilled wedding invitation keepsakes. If you have a burning question for me to answer here, please let me know. Quilling, the art of paper filigree, is my passion, since 1973.